What Is Greenboard Water Resistant Drywall? Greenboard is the pejorative term for a type of drywall that is used for walls in damp areas. Experts and industry professionals debate whether greenboard should be used in high-moisture areas. Some believe that cement board such as Durock is best used for tile in highly wet applications such as shower stalls, with greenboard and other water resistant drywall panels kept only to damp or dry areas. Others believe that water resistant drywall is an effective base material for walls in even the wetter places. Greenboard's paper facing alone does not inhibit mold growth. It must be treated with mold-resisting agents. 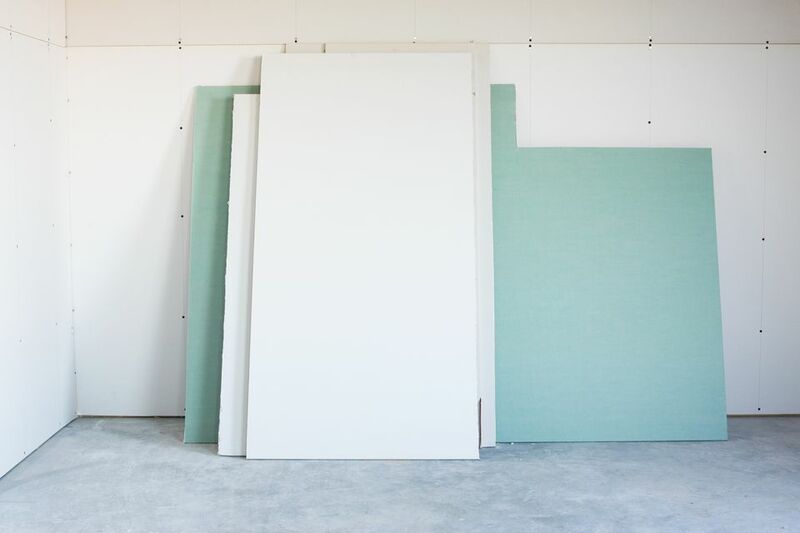 Greenboard is still manufactured and sold, but it is slowly being supplanted by paperless drywall that resists moisture and can be used in either dry or moisture conditions. Greenboard's inner core of gypsum is the same as regular drywall. Also just like normal drywall, greenboard is attached directly to the studs. Greenboard's outer paper covering resists water but is not considered to be waterproof. Some greenboard is impregnated with compounds that deter the growth of mold. Greenboard's paper cover is a sea-foam green on one side. The color imparts no special water-resisting properties, but it does serve two purposes. For one, it identifies this as water-resistant drywall. For another, it helps the installer better see where he is applying the drywall compound. Even without mold-resisting additives, the gypsum core of greenboard, like conventional drywall, does not support the growth of mold as it is not an organic product. Greenboard drywall comes in 1/2-inch and 5/8-inch thicknesses and conventional 4-foot by 8-foot sizes. The term greenboard is not official and is infrequently seen in company literature or at retailers. Instead, look for drywall advertised as being mold resistant or water resistant. Even though greenboard drywall is the same thickness (5/8-inch) as Type X, it should not be confused with the fire-resistant product named Type X. Type X should be used in areas such as kitchens where a fire might be expected. Type X drywall is required by building code for garages. Greenboard is found under such brand names as GP's ToughRock Mold-Guard Drywall Panel and American Gypsum's Aquabloc. Greenboard costs slightly more than conventional drywall. Is Greenboard Allowed for Wet Applications? Technically, greenboard and other water resistant drywall panels can be used in highly wet places. According to ASTM C 1396, Section 7, water-resistant drywall can be used in wet locations such as behind tile in bathtub or shower stalls. While greenboard drywall's paper covering is water-resistant, it is not waterproof. According to ASTM C473, after two hours of water immersion, the average water absorption for panels should not be more than 5-percent by weight. Caution should be taken when using greenboard and other water resistant drywall panels for ceiling applications. Ceiling panels can sag when subjected to high humidity conditions or to textures and finishing materials that contain moisture. Cement-based backerboards Durock, Wonderboard, and Hardibacker are all mineral-based, or cementitious, materials. Cement board is perfect for tile-covered wet applications like showers and tub surrounds. Wet or dry, such backerboard provides a stable base for tiling. Cement board will never biodegrade because it has no organic materials. The organic element to drywall's paper is the chief reason why drywall may experience mold and mildew. Another advantage of cement board is that it can be used as a base for tile flooring; drywall of any type can never be used for flooring applications. One reason why builders may use greenboard for highly wet areas, though, is because it is faster and easier to install and less expensive on a square-foot basis. It is best to use greenboard or other water resistant drywall in the large areas of bathrooms, kitchens, and other areas where the drywall may be subjected to lightly damp conditions, humidity, and the occasional minor splashes of water. Using greenboard drywall in a highly wet location is possible but cementitious materials are a better product for that location. At the least, severe mold growth will occur with drywall. Sag and outright failure may occur when the drywall has been subjected to an abundance of water. What Is Drywall Made Of? What's Behind My Drywall? This Wall Framing Guide Explains. Who Really Needs Ultra-Light Drywall?